The U.S. military confirmed Thursday that all 16 servicemembers aboard a special forces helicopter died when it crashed into a mountain ravine earlier this week, apparently after being shot down. Previously, American soldiers battling rugged terrain, bad weather and heavily armed rebels Thursday reached the wreckage of a U.S. special forces helicopter that was shot down and crashed into a mountain ravine. 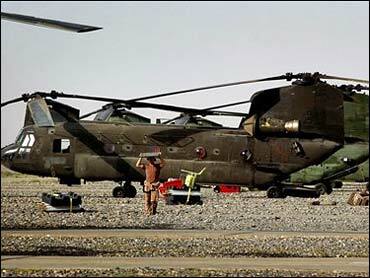 The remains of those killed were being recovered at the site in eastern Afghanistan where the MH-47 chopper went down Tuesday. The helicopter crashed while ferrying reinforcements to a battle against the insurgents, the military said in a statement. The military reported earlier that 17 people were on board but revised that figure to 16 later Thursday. "At this point, we have recovered all 16 bodies of those service men who were onboard the MH-47 helicopter that crashed on Tuesday," Lt. Gen. James Conway, director of operations for the Joint Chiefs of Staff, told reporters at the Pentagon on Thursday. CBS News Correspondent Lara Logan reports that a spokesman said there is still fighting going on in the area of the crash site, which occurred as part of an ongoing operation named "Operation Red Wing." U.S. military spokesman Lt. Col. Jerry O'Hara "there are still bad guys in the area" around the crash site and that troops were having to "do a recovery and a tactical operation at the same time." Logan said on CBS News' The Early Show that the province in northeast Afghanistan where the crash occurred is extremely mountainous and is known to be hostile to American troops. However, there has been some success in turning the feelings of the local people by paving roads and building mosques in the area. The Chinook helicopter was one of four carrying members of a special operations unit into an operation against al Qaeda and Taliban fighters near the border with Pakistan when a second helicopter reported seeing an explosion, reports Martin. Militants are believed to have shot down the helicopter as it was bringing in reinforcements for a battle with suspected al Qaeda fighters. A purported Taliban spokesman, Mullah Latif Hakimi, claimed responsibility, and also said rebels had a video of the attack. Even before the crash was announced, a Taliban spokesman claimed responsibility and said he had footage of the attack. As of Thursday, no video had surfaced. The helicopter was fired on as it was approaching a landing zone in the mountains. It flew on, but crashed about a mile away at dusk. The troops on the helicopter comprise eight Navy SEALs and nine Army air crew from the 160th Special Operations Aviation Regiment, which is based at Hunter Army Airfield, Georgia, and Fort Campbell, Kentucky, military officials said Thursday. The officials spoke on the condition of anonymity because the military has not formally announced the makeup of the forces on board. If the GIs aboard are confirmed dead, the crash would be the deadliest blow yet to American forces in Afghanistan, already grappling with an insurgency that is widening rather than winding down. A storm that hampered rescuers from reaching the wreckage on Wednesday had passed by Thursday. Recovery operations have also been made difficult by the rugged terrain of the remote crash site, reachable only by foot, and the continued fighting with militants. Officials in the United States said they knew of no communications from the crash site near Asadabad, in eastern Kunar province. The shooting down of the helicopter has shocked many in Afghanistan who only months ago were predicting a relatively peaceful lead-up to landmark legislative elections in September. But after the crash and three months of unprecedented fighting that has left nearly 700 people dead, few here remain optimistic. Logan reports that there has been increase in both the number of attacks and in the numbers of enemy fighters. She told Early Show co-anchor Harry Smith that it is all about the parliamentary elections coming up because they are for power at the local level and are critical to Afghanistan's future. The loss of the helicopter follows three months of unprecedented fighting that has killed about 465 suspected insurgents, 43 Afghan police and soldiers, 125 civilians, and 29 U.S. troops. Afghan and American officials have predicted the situation will deteriorate before legislative elections are held in September. The Taliban have stepped up attacks, and there are disturbing signs that foreign fighters — including al Qaeda — might be making a new push to sow mayhem. Afghan officials say the fighters have used the porous border with Pakistan to enter the country, and have called on the Pakistani government do more to stop them. The crash was the second of a Chinook helicopter in Afghanistan this year. On April 6, 15 U.S. service members and three American civilians were killed when their chopper went down in a sandstorm while returning to the main U.S. base at Bagram.